Blogger has a new format called dynamic views. 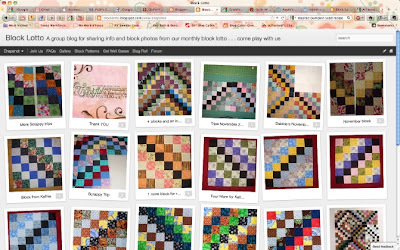 I noticed it yesterday on Julie Wy’s blog, So and Sew. asked her about it and started playing around with it today. I like how some of these views show you a LOT of block images on one page. A couple things you’ll notice disappears in these views: all the information in the sidebars … disappears and our Block Lotto banner. If I make the switch to using dynamic views, I will move a lot of the information now in the sidebars to PAGES. What do you think? If you like the dynamic views, which is your favorite? If you have a blog on Blogspot and want to know about how to add this feature to your blog, go to help and search for Dynamic Views. Here’s one article that describes how to add them. I like what we have best. I like the sidebars where they are, easily accessible. 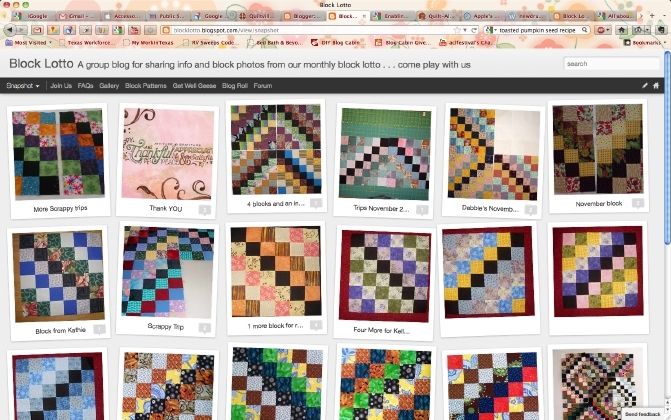 I can easily see what the blog labels should be. I can see the block list and know mine made the count. I can see "what we're blogging about" & check out other blogs. I would miss the sidebars. I find myself not really reading a blog that has the dynamics. All the pictures look cool, but I rarely click on them to see the post. I tend to move on. If we switched, we'd have one PAGE that had everything you needed to know for a give month–the link to the guidelines, the list of blocks made, the labels for the month … so all that info wouldn't disappear, it would just be a click away. I personally read blogs using a reader–dynamic views have no impact on those. The layouts are fun to play with. Some of them are more visual and I like not having to scroll, scroll, scroll to see what's been posted lately – this is especially true on Block Lotto where there are so many posts. It would take some getting used to, but I like the idea. It's true that I like what I'm used to. A couple of the views were so visually confusing! But I did like the one you showed in the post, so we could see all the blocks as a mosaic of color. I think that was Flipcard? That was neat! As long as the viewer can switch, those who like the classic can just click on that when coming on the blog, right? Okay IF you change it, I choose the flipcard. Great stuff. It's hard to choose a favorite. I like the time slide and also the flipcard and mosaic. The Snapshot view is FUN! Sorry Sophie, I'm viewing on an iPad, and can't seethe options, but I'll be able to see after you've made the switch, so I hope you have fun choosing!